I just finished reading The Wrecking Crew, Kent Hartman’s overview of the session musicians that played on so many Top 40 radio hits (to be reviewed here shortly), and began Carole King’s memoir A Natural Woman when along comes this perfect sonic compliment to both. 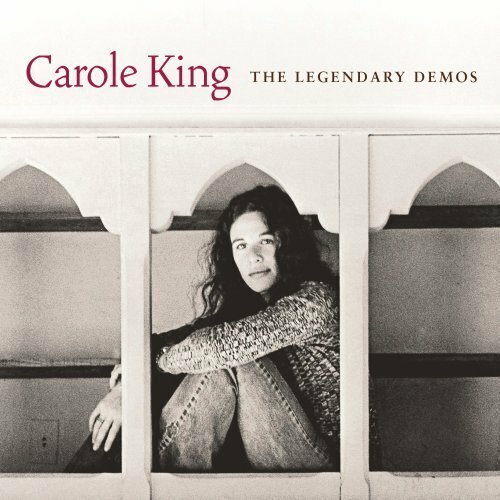 Carole King – The Legendary Demos is exactly as its title describes, a collection of 13 of King’s recordings originally created to pitch her tunes to the various artists who sometimes turned them into million selling hits. Demos offer a glimpse at a song’s embryonic state and insight into the writer’s initial intent. It’s always interesting the hear how a songwriter interprets their own works when definitive versions have been rendered by others and are ingrained in the public mind. The author’s version usually pales in the shadow of the hit but King’s demos reveal that her distinct phrasings and pronunciations were often copied directly as if learned phonetically. There is a lot more “Carole” in the hit versions than one would have imagined. Her vocal arranging skills, honed from her high school days, are well represented in even her earliest tapes. Background and response vocals were for the most part copied verbatim by the recording artists and producers. While you’d would be hard pressed not to prefer Aretha Franklin’s (“You Make Me Feel Like) A Natural Woman” you’ll also be surprised to hear how closely the feel of the demo is followed. Stripped to basics, tunes like “Take Good Care of My Baby” point out the melodic nuances and rhythmic patterns King delineated in her piano work. It’s enlightening to examine how arrangers took many of those simple cues and turned them into lush string or horn counterpoints. Alternately you can hear how efficiently King could pitch a tune by approximating the style of established artists. Her harmonies on what became The Everly Brothers hit “Crying In the Rain” highlight that ability. A perfect example of how demoes could be surpassed or lost in the translation is heard on the first two tracks. While Carole’s “Pleasant Valley Sunday” offers a lyrically sophisticated rumination on the quirks of 1960’s suburbia it lacks the signature guitar lick we’ve all come to associate with the tune. The Monkees version, produced by Chip Douglas (also the tune’s bassist) introduced Mike Nesmith’s fuel injected riff (based on George Harrison’s “I Want To Tell You”) and set it on a trajectory for the top of the charts. On the other hand The Monkees reading of “So Goes Love” as recorded for their eponymous first album, but left unreleased until the first Missing Links compendium, totally misses the mark. King’s demo reveals it as “one that got away”. Had it been completed more closely to her demonstration tape – especially the complex background harmonies – it could have easily been a chart topper. Eventually Carole King left her Brill Building roots and along with Joni Mitchell, Jackie DeShannon, James Taylor and CSNY helped to usher in the Laurel Canyon singer/songwriter model that became a staple of 70’s FM rock. Her album Tapestry, sold millions of copies and made her a star in her own right. Quite honestly the demos for songs King made famous herself are less exciting to hear because they feel less revelatory. It’s an exceptional treat to have these sometimes bootlegged recordings available in excellent condition to explore. They are as enjoyable to hear as they are historically valuable. What’s missing for me? I would have loved the inclusion of two gems from The Monkees soundtrack to Head, “Porpoise Song” and “As We Go Along.” With her memoir topping the New York Times best seller list and interest renewed in the author’s back catalog I’m hoping a second helping of legendary demos will be in the offing soon.